What a relief when the rain finally came. And it really came down heavily at times. So much so that it woke me up last night. But I liked the smell that it left on the concrete and grass outside, the sound it made when it hit and banged against the windows and roof. I liked the feeling that we could almost be in a different season, perhaps at the end of summer, or in another country. “Seriously, I feel as if we were in a tropical country,” P. told me as large droplets kept coming down rhythmically in heavy downpours. We could not ignore the pleasant music the rain created outside. The temperatures cooled down too and we were finally able to wear pants, and even a light jacket. Delight! I had not made big plans for the day and as I looked outside the dining-room window, contemplating the unceasing lightning in the sky and hear the thunder grumble in the near distance, I suddenly felt a strong urge to bake. In fact, to bake cookies. P. often complains that I never bake cookies. And he is right. Perhaps I would have needed to be born American to have this spontaneous baking talent in me. Clafoutis, crème brûlée, île flottante or oeufs à la neige, sabayon, mousse, charlotte, petits pots de crème or tartelettes aux fruits would never be an issue: there is always one or the other around in the house, visiting my kitchen almost daily. But cookies? I simply don’t think enough about them. We never baked cookies at home. C’est pas dans ma culture. So when the desire seized me, you can trust me, I did not hesitate. I grabbed it and pulled out the ingredients I needed. I’ve always had a strong inclination for natural healthy eating and cooking. At home, I was taught to eat and cook this way. So in my pantry, I always make sure to have a wide selection of different baked products available. Flours? 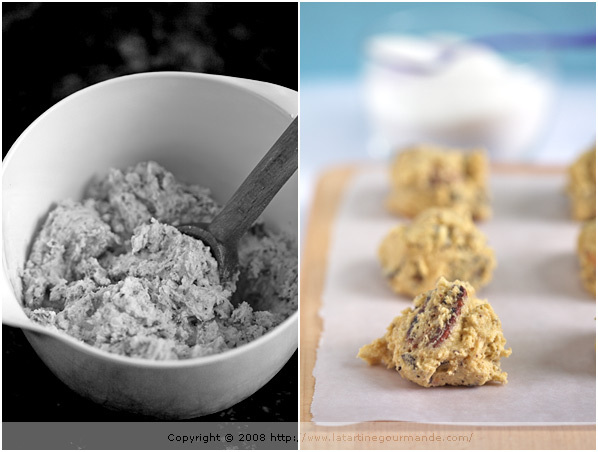 I have many many types, so for my cookies, I liked the idea of using quinoa, brown rice, millet and amaranth flours and combining them to quinoa flakes. But there is also another reason which you may have been curious about. Let me say a few words about it, if you will, and explain to you why I’ve recently stopped eating wheat, and gluten generally speaking. So why cutting down on wheat, and gluten you may wonder? To cut my long story short, let’s say that a genetic test — yes yes, a real DNA test — showed that I had a predisposition to gluten intolerance (both my parents gave me one gene). And at the time I was tested, I was reacting to gluten. It came around about a year ago, more or less, after our trip to Peru — during which I was once pretty sick because of the food. My body did not like it. I did not like it. I became an active researcher of the root of my problems, trying to rid myself of unpleasant symptoms, keen to find out what to do — think as if your immune system is always in reactive mode. And in my case, it worked. It really quietened things down. Of course, I wondered too: is it a permanent thing? The good news was that in my case, it was not. Because our bodies keep going through cycles and changes, and that reactions like this one can come and go. My body simply needed some time to heal. I gave it this time. At first, removing gluten was a challenge. But I truly grew into loving the challenge, and learned a ton from it, boosting more creativity than I expected. I even think that I became a better and more experimental cook and baker, a more creative one for sure. I found my gluten-free baked goods always lighter, often tastier too — notice that flours like amaranth, teff, quinoa are full of nutrients and vitamins that also give a lovely taste to your finished products. In fact, many of my friends who tasted my gluten-free dishes could never guess — I did not tell them beforehand. And they really enjoyed them even more. Needless to say that for someone like me who likes to bake so much, that was plenty to make me happy. Don’t be surprised then if I decided to bake these cookies gluten-free — you can always decide to substitute the flours, if you found them hard to find, or did not feel like using them. In such case, I would suggest to substitute the brown rice flour with whole wheat flour, or all-purpose flour. I personally have grown extremely fond of rice, amaranth, teff and quinoa flours in particular. The cookies turned out light, deliciously nutty and chocolaty, but not overly so either, with un petit goût de reviens-y (with a taste of come back to them). And since I can never eat one only, I ate two. And a third one later in the day when the sun was already back, clearing the sky from the dark-looking clouds, loaded with more rain I am sure. Cookies need to be eaten par deux ou plus, non ? PS: Merci Fred for the lovely green cups. I love them, as you can tell! Preheat the oven at 350 F. Line your baking sheet (or two) with parchment paper. In a large bowl, whisk together the different flours, quinoa flakes, baking soda, baking powder, and salt; set aside. In a large bowl, or the bowl of your stand mixer equipped with the paddle, beat the butter until light, then beat in the sugar. Stir in the maple or vanilla extract. Mix for a few minutes and then add the eggs, making sure the first one is well incorporated before adding the second — scrape down the sides of the bowl a few times. Add the flour mixture slowly, mixing until just homogeneous. Then add the chocolate and nuts. Place 1 large Tbsp of dough for each cookie onto the baking sheet, making sure to keep them about 2 inches apart. Bake the cookies for about 12 minutes, until the edges start to be golden in color — they will harden as they cool. Let them cool on racks, and eat right away, or whenever you feel like it. Préchauffez le four à 180 C. Couvrez une plaque de cuisson (ou deux) avec du papier sulfurisé. Dans une jatte, mélangez les farines, les flocons de quinoa, la poudre à lever, la bicarbonate de soude et le sel; mettez de côté. Dans un grand bol, ou le bol de votre mixeur à pied (équipé de la spatule), travaillez le beurre en pommade. Ajoutez le sucre et mélangez pendant quelques minutes jusqu’à ce que la consistance soit légère. Ajoutez l’extrait d’érable ou de vanille. Mélangez puis ajoutez les oeufs, un à un, en attendant que le premier soit bien incorporé avant d’ajouter le second — raclez les bords du bol plusieurs quand vous travaillez cette pâte. Ajoutez alors doucement la farine, et mélangez (pas de trop) jusqu’à ce que le tout soit homogène. Ajoutez ensuite le chocolat et les noix. Placez 1 grosse cuiller à soupe de pâte pour chaque cookie sur la plaque de cuisson. Espacez-les de 5 cm. Faites cuire pendant environ 12 minutes, jusqu’à ce qu’ils commencent à dorer sur les côtés — ils se raffermissent en refroidissant. Laissez-les refroidir sur une grille, et dégustez de suite, ou quand cela vous prend. This recipe sounds like a winner and your photos are gorgeous, as always. For a while, I also suffered from zero gluten or dairy tolerance (it, too, has since vanished), and discovered the fun in vegan baking. It was always even more satisfying when my company did realize I was serving them something “healthy”! I am glad to benefit from your experience. I want to incorporate more flour types on my diet but I do not know how to start. It is fun to discover new tastes; otherwise are palates get bored. Jerome and I like to bake cookies together. Home-made cookies in a cool jar is always appreciated as a hostess gift. The key is to come up with original recipe. I bookmarked your recipe for our next cookie baking session. The combination of flours you used sounds intriguing! The nuttiness and depth of flavors it imparts is what really is the winner. what a wonderful recipe bea. I am also on a gluten free diet for an autoimmune disorder I have. funny considering I am a pastry chef. I am not completelygluten free all the time but most. I will definitely bookmark this recipe. your photos re always so bright and transmit a great mood… love it! A voir tous ces ingrédients délicieux, tes cookies ne peuvent être qu’excellents! We too had a downpour last night followed by a cool morning. I baked chocolate chip banana bread. Thanks for the gluten-free cookie recipe. I’ve enjoyed all your wheat free recipes. I can’t wait to try this one too. I don’t have issues with gluten, but I LOVE eating baked goods with different grains. You get such interesting flavors. Although this post (and the photos!) is wonderful, I am glad you have a predeliction for baking clafoutis, crème brûlée, île flottante or oeufs à la neige, sabayon, mousse, charlotte, petits pots de crème or tartelettes aux fruits. America needs more exposure to these as well. All wonderful. Thank you B for another great post. I am glad you found the root of your illness and that you are able to correct or at least lessen the symptoms. lovely cookies! With all the rain we’ve had, you must have made lots and lots of cookies! what a beautiful photos ,great blog bravo! Voici donc la raison pour laquelle tu nous présentes des recettes sans gluten! Magnifiques photos ! Textes invitant à cuisiner et à faire de la pâtisserie ! I do love your blog. I like cooking so much and what’s more I love English. So what a surprise when I discovered your posts that mingle my favourite hobbies. Please forgive my English if it’s not perfect. Anyway thanks a lot and go on writing because I’m greedy. Ce post est spécialement beau, bravo Béa! Cookies are great!! I like them with pistachios, cranberries… and many more!! Thank you for this recipe! And thank you for introducing me to other flours. You mean there’s more than “All Purpose”? 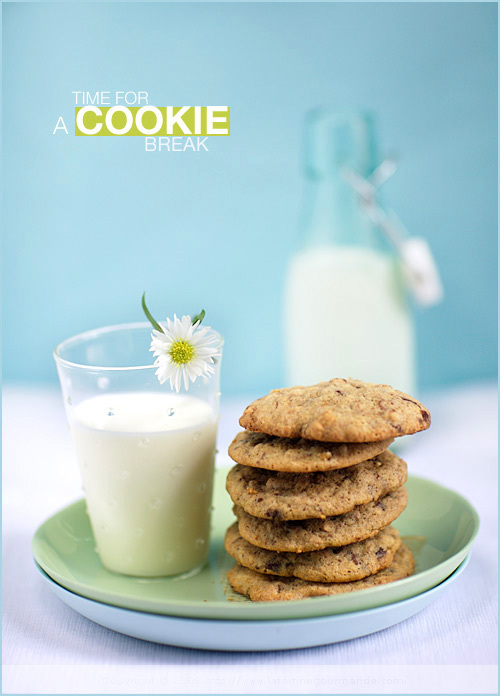 As a cookie-loving American, I have been hunting for some healthy cookie recipes. I have been also hunting for quinoa flour(and others), there’s not very many decent health food stores near me. I think I might have to resort to finding it on line. I can’t wait to try this! ces photos me donnent vraiment envie de cookies !! Just two days ago I was looking to be inspired by a cookie recipe-so naturally the first place I looked was your blog. I thought exactly what you said-it mustn’t be a french phenomena-there are no cookie recipes! These look wonderful-merci. I have the same story when comes to why I eat the way I do. Et quelle difference! I feel so much better and I love experimenting with new possibilities. I enjoy your blog, your writing, recipes and the delightful pictures. Merci! For a Cookie Monster like me, these are just perfect, Béa. je n’ai pas le temps de lire la recette, mais les photos sont superbes,et j’aime bien ce proverbe…. I’m a long-time reader and a first-time commenter but I would just like to say that your pictures always look so delicious. And those cookies are no exception! How did you get tested? What kind of doctor did you go to? I am SO glad I read this article – my father is a celiac and is certain that he developed the intolerance over time. I am really really worried about “developing” an intolerance but I’ve never known if that concept (the development of the intolerance due to exposure) is a legit issue or not – from your experience, it sounds like it is! My husband asked me for chocolate chip cookies when I handed him a macarons…oops! I just don’t think about those given the myriad of other possibilities out there. I am bookmarking this recipe for my gf clients. Thank you! Singapore has been raining non stop these days, makes me want to laze around at home instead. Baking is definitely a good idea! The cookies looks so delicious, can’t tell they’re gluten free. I will love to try making these cookies but the flours are a little difficult to find here. 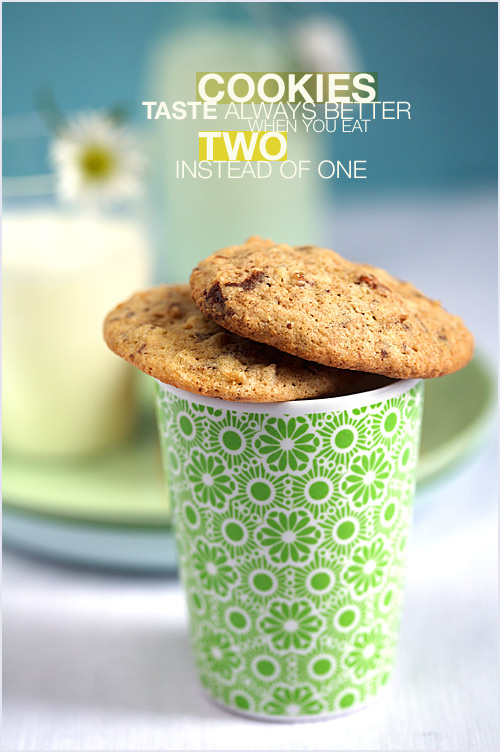 You’re right, two cookies DO taste better than one! Merci! quelle joie de vous avoir rencontrée par hasard sur le Web! 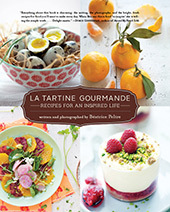 J’adore vos recettes, la beauté de vos images… on a tellement besoin de beauté! Alors… merci pour ce que vous nous donnez. It IS interesting how everyone’s food choices are shaped by our upbringings. Cookies, for me, are a staple of baking. But clafoutis, crème brûlée, sabayon, mousse, and tartelettes aux fruits are on my “to attempt” list. I agree that non wheat flours are very tasty. 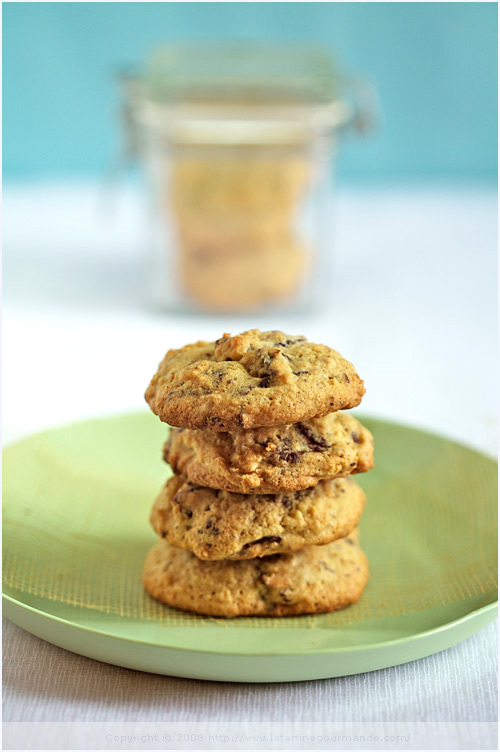 If you can tolerate oats and oat flour, add that to your cookies. It is really good and makes a chewy cookie. You just have to source it from a manufacturer that can guarantee that it is not contaminated by other flours and gluten. You certainly have done it with these cookies. I immediately went to the kitchen and made them for me and my grandson. He was walking in the door when I was taking them out of the oven. He devoured them very quickly and gave them two thumbs up (his mouth was too full to speak). Thanks. * By saying ‘quinoa flakes’ do you mean PUFFED quinoa? because I only came across this version. * Also, which two other flours would you recommend for this recipe instead of the millet and amaranth flours, which are more difficult for me to get? Do you think teff is suitable? Many thanks again everyone for stopping by! Lonna, I am so pleased to have been given the two thumbs up by your grandson. That rocks! Tal, it is really quinoa flakes. Mine are from Shiloh Farms, and I bought them online. As to the other two flours, instead you could try teff, or if this is hard to get, simply add more quinoa flour. The flour will be different of course. In case you are not after a Gluten free version, there are more options too. Good luck, and note that a lot of these flours are available online (I buy amaranth online too). I usually use smaller amounts of quinoa flour since I find its taste stronger and more dominent than other flours, especially in delicate cakes I baked. I have to experiment with teff though. I was wondering where to purchase these flours? Also, I once made choc. chip cookies w/part mesquite flour and they were out of this world. I buy most of these flours at Whole Foods in the US. As for amaranth flour and quinoa flakes, I buy them on line. Mesquite flour is quite intriguing, and I am now curious! Chocolate Chip Cookies recipies are the BEST! I feel so relieved reading your wonderful gluten free recipes…I have been baking without wheat for years now after discovering an intolerance to it, but have since become intolerant to gluten. Needless to say, there was remorse at the thought of losing my favourite treats and being left with bland cardboard like yuckies instead of goodies. I feel so encouraged and inspired by seeing your successes! Thank you for posting your wonderful recipes, beautiful photos and stories! Your work with recipes is amazing, the research you’ve done to find gluten free recipes – that was not an easy task. Your site inspires me to cook with more imagination, to decorate what I serve to my family and friends, and, most important thing of all, to choose healthier choices. 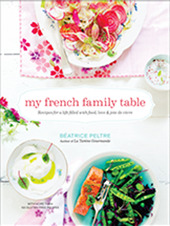 Looking forward to try your recipes, especially gluten free ones!!!! Your recipes are lovely; this cookie recipe sans gluten prompted me to research more desserts w/o gluten. If you ever feel like straying from your French desserts (not likely), check out BabyCakes NYC. I love your blog! Hi, a friend ha give me the link to your blog since I an only eat gluten free. I look forward to trying your recipes. I note that you do not include xanthan gum to ‘hold’ the flours together. Every gluten free recipe I have used to now includes xanthan gum and when I haven’t used it my cookies or cakes have crumbled like sand. Is it the amaranth flour perhaps that is giving some to the mixture.? Et moi, j’habite en France depuis 7ans (hautes Pyrenees) meme si je suis australienne, c’est interessant de lire vos commentaries et vos recettes. Merci!